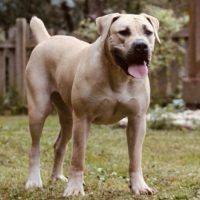 Leo is an amazing Boerboel. He received the highest appraisal score in the U.S. in 2017 (NABBA). We look forward to carrying on his line through pairing him with Laila and Raven in 2019. Raven is our black beauty. 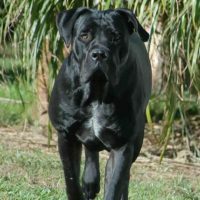 Her grandfather was the highest appraised black male Boerboel (Spitsvuur Ramkat). Raven has had one litter of amazing Boerboel pups, and we have incorporated three of them into our program. 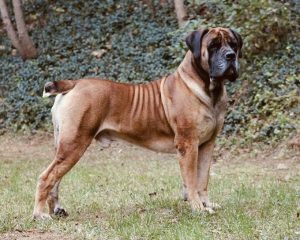 We desire to breed Boerboels of a high standard able to perform their task as well as being attractive. All of our Boerboels live within family environments. They are not kennel dogs but rather family companions, raised with children. We also desire to maintain our integrity – and in contacting us you will receive honest answers to your questions rather than a sales pitch. We want to ensure that those who become interested in purchasing Boerboel puppies from us will be fully satisfied. If that means recommending a different breeder or breed to you, we hope to be honest in doing that. Please feel free to contact us learn more about our Boerboels and future litters of Boerboel puppies.